Janine Washle is one of my Facebook cooking friends. I was very touched when a large box of books arrived along with a note that she had found some wonderful cookbooks along The 127 Corridor Sale, AKA, The World’s Longest Yard Sale. Since I had never heard of this event before I had to google it, then asked myself why I had never heard of it! The 127 Corridor Sale sounds like the most fun road trip ever. The event began in 1987 by officials in Kentucky and Tennessee to promote attractions and yard sales along the back roads of the two states. It now spans six states and stretches for 690 miles! If you travel the entire route, you will pass through Michigan, Ohio, Kentucky, Tennessee, Georgia, and Alabama. There are about 5,000 vendors along the way offering antiques, hodgepodge from people’s closets and attics, making it like a cross between a church rummage sale and an antique roadshow. Most people love to find bargains and buried treasure but also to socialize, hear stories, meet new people, and basically have a good time. It’s like a journey through rural Americana where you can explore country culture, music, and local cuisine. Sounds like fun to me, although I will have to wait until next year. The event takes place annually starting on the first Thursday of August and extending through Sunday. Now look what the very generous Janine found along the 127 and mailed to me. Okay! Okay! We get the message! My goodness, I think it must be a good cookbook that she wanted kept in pristine condition if one had to even wash their hands before opening. Not only that, sounds like you had to sit there with her as you looked at it. Janine left me a note that said, “I’m not able to get the cookbook back to her apartment, but I can get it back to you in Illinois!” Thank goodness she did because it’s a great cookbook. I know this because it was one of my favorites I lost in the flood. However, this one is now much more special. Not only because it has a priceless notation from the former owner, but because Janine found a book along that long 127 Corridor Sale that her heart told her might fit in perfectly to the Culinary Cellar. Little did she know how special it was and how happy I am to have a copy back. Thank you, Janine. You made perfect choices. 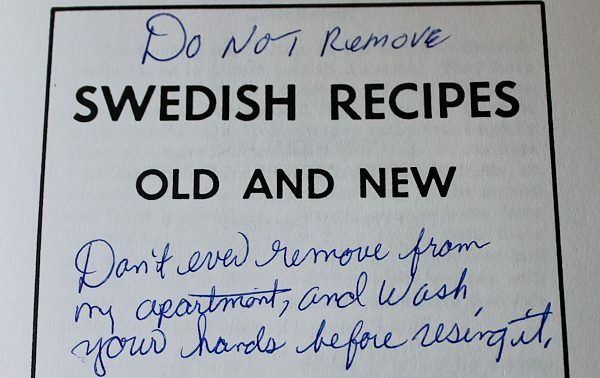 Looking through the cookbook, I almost made some Swedish meatballs but my husband Bill was going on a long workday today and he loves having cookies to munch on here and there during the day. I found some refrigerator cookies called Brysselkax. 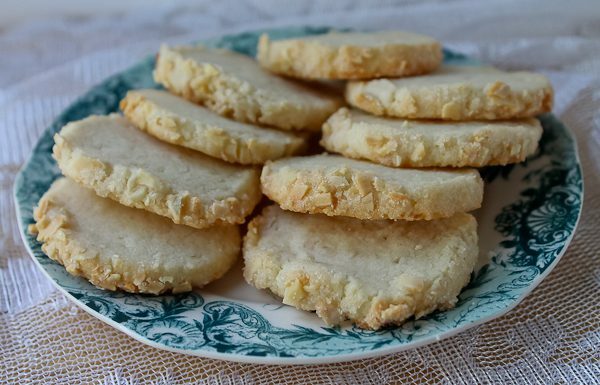 It’s a simple butter cookie, the kind that melts in your mouth. The dough is made into two logs and refrigerated at least several hours or overnight. When ready to bake each log is brushed with egg white and then rolled in a mixture of sugar and finely chopped almonds, sliced and baked. They are delicate and so good. Hopefully I’ll be able to make the trip myself down the 127 and search for more cookbooks. I just don’t want to run into the woman who owned the Swedish book. She would probably inspect my hands to be sure I washed them. And I hate to tell her, but on page 133 of these refrigerator cookies there is now a little drip of egg white and a butter stain. In large bowl of electric mixer, cream butter; add ½ cup sugar and cream until light. Add flour and extract. Mix well. Shape dough into 2 equal-sized rolls, about 1-inch in diameter. Wrap each in waxed paper. Chill in refrigerator at least several hours or overnight. When ready to bake, heat oven to 400 degrees F. Line 2 baking sheets with parchment paper or use ungreased nonstick baking sheets. 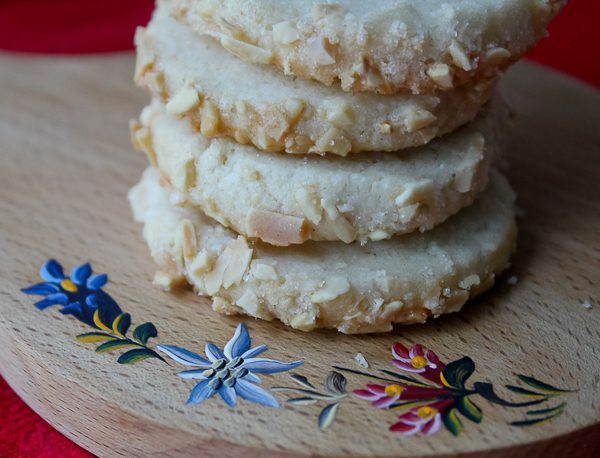 Stir together the chopped almonds and 3 Tablespoons sugar and pour out onto a flat work surface or cutting board. Working with one roll of dough at time, brush each with the beaten egg white and then roll each in the almond-sugar mixture, coating entire log. Using a sharp knife cut each log into ¼-inch crosswise slices. Bake for 8-10 minutes or until edges are just golden. Remove from oven and let cookies stay on baking sheet for a few minutes before removing to a wire rack to cool. Truly my pleasure. Thank you for your dedication to cooks, and their books. Thank you, Janine. It’s my daily love to try and make the world a better place through cooking, cookbooks, and to honor all the wonderful cooks out there. What a fun, fun trip that would be!!! I had never heard of it either. I bet there were a ton of people there having a blast. Debbie I am so glad Janine ran across this book for you. You must have jumped for joy!!! You should be getting my box in a couple of days. I hope I sent you some that you are really going to like. I’m sure I will, Lisa. They’re from you! Debbie, thank you for sharing this latest! I’m also glad that you are getting your supply of cookbooks replenished! You’ll really have fun testing the various recipes! Thanks, Dawn. I’ll have fun for a long time testing recipes from all the new books. you hadn’t heard about the “longest yard sale” you must not watch much DIY channels…. I’ve been pining to go… but the idea of traveling the South during Summer is not to appealing to me… the heat… the humidity…. THE BUGS! Enjoy your cookbooks! Haydee, you are right. I don’t watch DIY channels! I’m more cooking shows, Game of Thrones, and Hallmark Channel. How’s that for a strange combo?! Lovely story and recipe Debbie! And I laughed out loud at the end….ooops!!!!! I got such a kick out of what the woman wrote in the book. I have never heard of anyone so protective of a cookbook as telling people they had to wash their hands before touching it! It makes me laugh every time I read it. 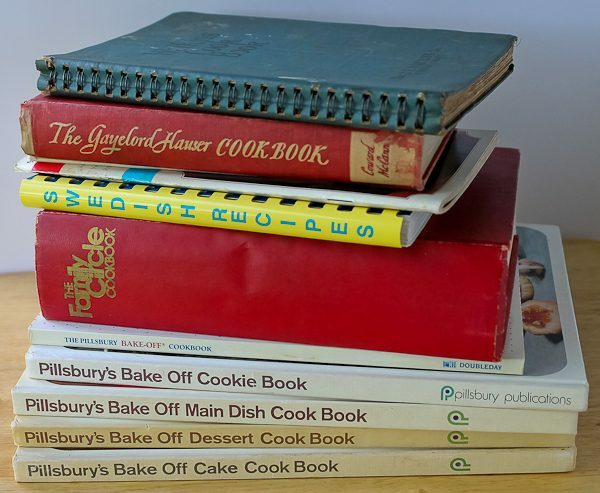 I, too, love those old Pillsbury bakeoff books, and smile every time I look at them on our bookshelf. 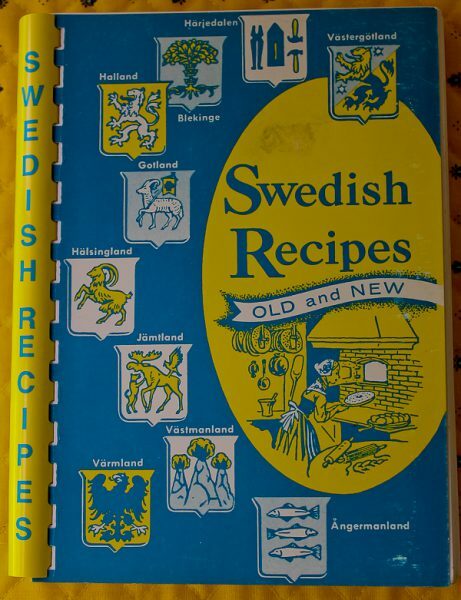 Karen, you’ll find lots of good recipes in the Swedish cookbook, especially the breads and cookies! Oh my do those cookies ever look good! I love the support, stories and cookbooks you’re getting to rebuild your culinary cellar. Thanks, Brenda. And the cookies were great!